Published on August 16, 2015 in California Builder & Engineer, Daily Dirt and National. Closed Tags: ABC, Associated Builders and Contractors, concrete, concrete products, construction, construction industry, contractors, economy, employment, equipment, Federal Highway Trust Fund, gas, heavy equipment, infrastructure, jobs, lumber, pavement, roads, safety, softwood, transportation. “Key input prices fell or were flat in all but one category in July and further downward pressure on input costs is likely to be reflected in next month’s report.” —ABC Chief Economist Anirban Basu. 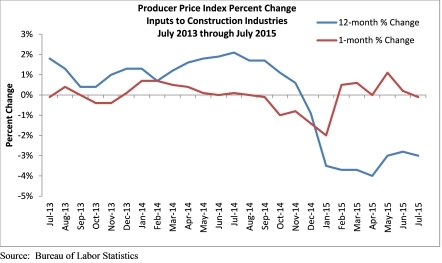 “Key input prices fell or were flat in all but one category in July and it is important to note that further downward pressure on input costs is likely to be reflected in next month’s report, as well,” said Associated Builders and Contractors Chief Economist Anirban Basu. Published on October 28, 2013 in California Builder & Engineer and Daily Dirt. 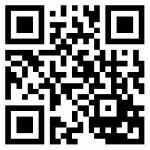 Closed Tags: asphalt, construction, construction industry, contractors, economy, infrastructure, Interstate Highway System, National Asphalt Pavement Association (NAPA), pavement, roads, transportation. on Interstate 5 in Northern California Highlighted in National Award. 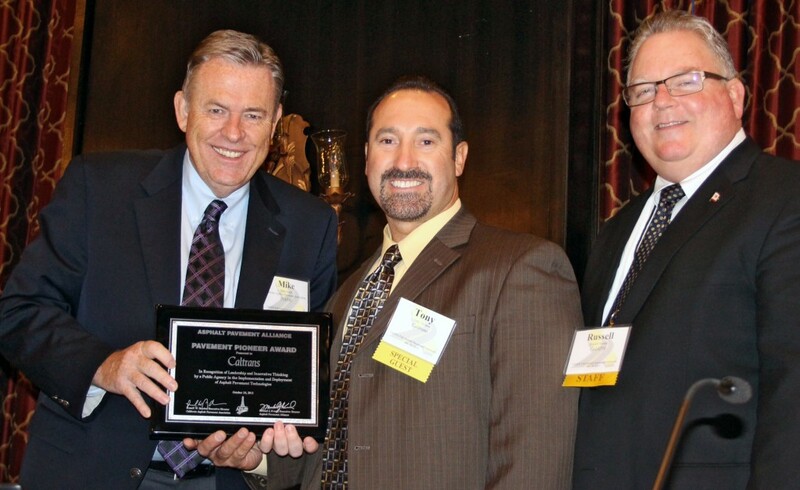 The California Department of Transportation (Caltrans) has been recognized with a national Pavement Pioneer Award for the innovative long-life asphalt pavement projects recently constructed on Interstate 5 in Northern California. The award was presented to Caltrans Director Malcolm Dougherty at the California Asphalt Pavement Association (CalAPA) Fall Asphalt Pavement Conference in Sacramento. Mike Acott, president of the National Asphalt Pavement Association (NAPA), presented the award on behalf of the Asphalt Pavement Alliance (APA), a national organziation supported by NAPA, the Asphalt Institute, and state asphalt pavement associations, including CalAPA. “The Pavement Pioneer Award recognizes agencies that utilize innovative designs, materials, and methods to deliver durable asphalt roads that are high-quality, long-lasting, and an outstanding value for the taxpayer,” Acott said. The Pavement Pioneer Award recognizes the department’s headquarters Pavement branch and the regional office in Redding for their work to deliver two long-life asphalt pavement projects. Long-life asphalt pavement, also known as Perpetual Pavement, is a special asphalt pavement design methodology characterized by a deeper base that has been shown to last for decades with only minimal maintenance to the surface layer. “For the past 12 years, the Perpetual Pavement Award program has recognized agencies for existing pavements that have continued to perform well beyond 40, 50, 60 years. 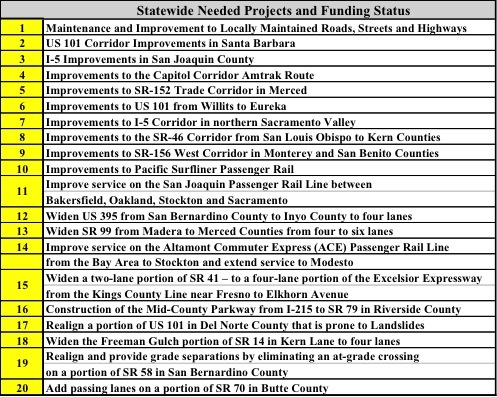 But Caltrans is are building pavements today that will win a Perpetual Pavement Award in future decades,” said Mike Kvach, Executive Director of the Asphalt Pavement Alliance. Generally pavements must be in place for more than 30 years to receive an APA Perpetual Pavement Award, but CalAPA and the APA honored Caltrans for the way it moved forward aggressively with the durable pavement strategy not only on the Interstate 5 projects but also on Interstate 710 in Los Angeles County and Interstate 80 between San Francisco and Sacramento. Caltrans’ pioneering work with durable, long-life pavements has received national attention. The first project, valued at $17.5 million, spanned a stretch of I‑5 in Siskiyou County near the community of Weed. The second project, valued at $31 million, covered a 15.5 mile stretch of I‑5 near Red Bluff. The projects were constructed in 2012 and 2013. Published on August 14, 2013 in California Builder & Engineer, Constructioneer, Daily Dirt, Events, Midwest Contractor, National, New England Construction and Rocky Mountain Construction. Closed Tags: construction, construction industry, contractors, Environmental Excellence Awards, environmental stewardship, NDA National Demolition Association. National Demolition Association (NDA) presented the 3nd annual Environmental Excellence Awards to five companies which have performed demolition projects that demonstrate significant environmental conservation and community improvement, while bringing about a discernible positive impact on the quality of life in the U.S. and Canada. “The Environmental Excellence Awards recognize NDA member companies which are true leaders in environmental stewardship,” said Michael R. Taylor, CAE, Executive Director of the NDA. 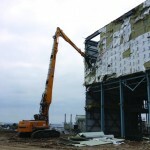 “Environmental stewardship is one of the demolition industry’s primary missions and these winning projects help illustrate truly dramatic efforts our members have made to make this a reality. Bierlein Companies partnered with AKT Peerless Environmental and Energy Services to reform environmental remediation and demolition services at the Downtown Saginaw Redevelopment Project. 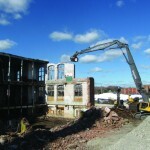 The scope of the project included the demolition of the eight-story Crowne Plaza Hotel and the adjacent 160,000-sq.-ft. Downtown Saginaw Mall. The work also included abatement of 200,000 sq. ft. of asbestos material and universal waste removal. 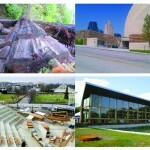 Some 98% of the building materials onsite were recycled. During the demolition of the Plymouth Cordage Mill in Plymouth, MA, Costello Dismantling was looking for innovative ways to recycle high-quality Southern Yellow Pine beams and structural decking in the building that have been exposed to more than a century of saturation from mineral oil used to condition hemp fibers prior to rope manufacturing. After rigorous testing, sorting and shredding, the lumber was converted into 4,500 tons of bio-fuel. 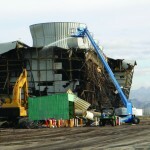 EDS received a turnkey contract to dismantle and pack all process equipment; to perform the complete remediation of all contaminated materials; to remediate and decontaminate the entire site; to complete the demolition of all buildings and other structures on the site; and to recycle all of the structural steel and non-ferrous metals on site. The object of the work was to provide the local community with a remediated site and green area for future park and golf course development. The goal of PlanetReuse’s projects is to increase the reuse of reclaimed materials in a way that is beneficial to the owners, the demolition and recycling industries, and the end users. Examples include the reuse of 86,000 sq. ft. of cypress, reclaimed hemlock, Douglas fir, and pine/spruce in a school in Greensburg, KS; the use of reclaimed material for the exterior walls of Kansas City’s Kaufman Center of the Performing Arts and bridges in Utah; 10,000 sq. ft. of oak flooring from a restaurant in Kansas City’s Power & Light District which was processed for reuse as flooring in two new retail project; and recycled portion of President Obama’s inauguration state into framing and walls for the Omega Institute for Sustainable Living in Rhinebeck, NY. 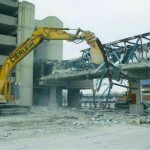 The National Demolition Association is a non-profit trade organization representing approximately 800 U.S. and Canadian companies and many international firms that are involved in the demolition process. Membership includes demolition contractors, general contractors, civil engineering firms, and recycling, landfill, and salvage operations. The association’s efforts help members stay abreast of environmental, regulatory and safety matters, keep regulators informed about issues facing the industry, increase public and industry awareness, and provide members with networking opportunities and information on the latest technical advances in equipment and services. The website is www.demolitionassociation.com.